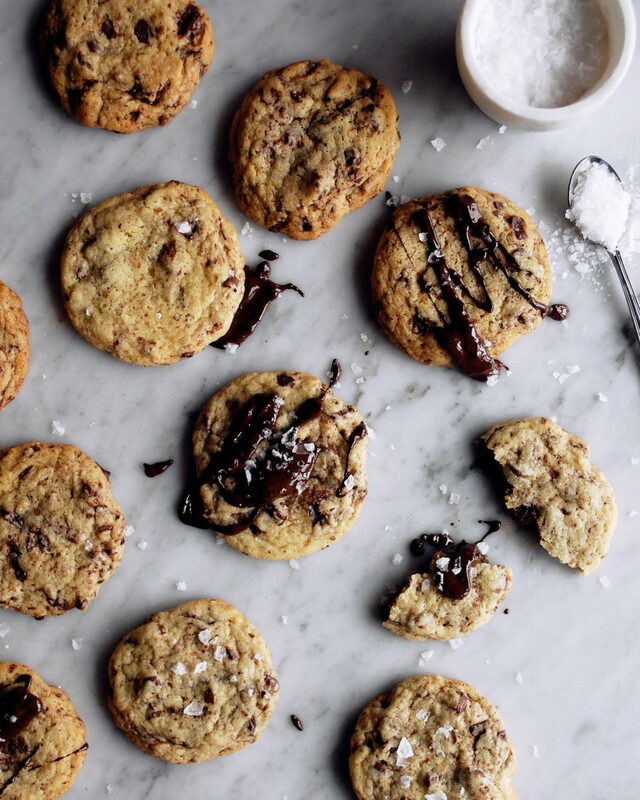 If there’s one cookie recipe you need in your back pocket, it’s this one…Soft & Chewy Chocolate Chip Cookies. The only real story behind these cookies is the fact that it was a Friday night, and I just really wanted to bake some cookies. I didn’t want anything fancy, no new flavors, just a simple chocolate chip cookie. And these turned out better than ever. 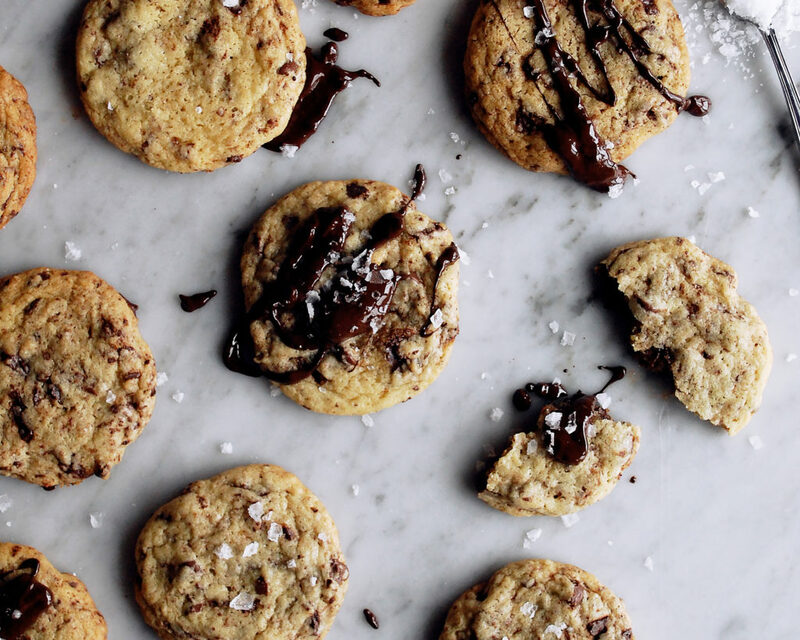 They are so simple, yet completely satisfy that cookie craving. Plus, they’re soft, incredibly chewy, and basically just melt in your mouth. I’ve used dark chocolate here, but you could really use any chocolate you’d like. And speaking of chocolate, I like to have some extra on hand and melt it. 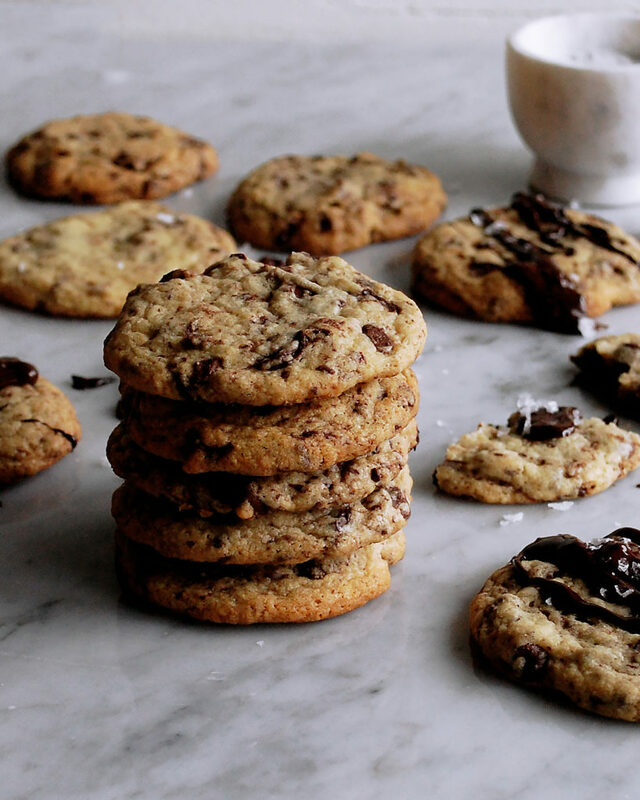 That way, as soon as the cookies come out of the oven, you can drizzle a good amount of chocolate right over top. Add a sprinkle of flaky sea salt and you’re good to go. 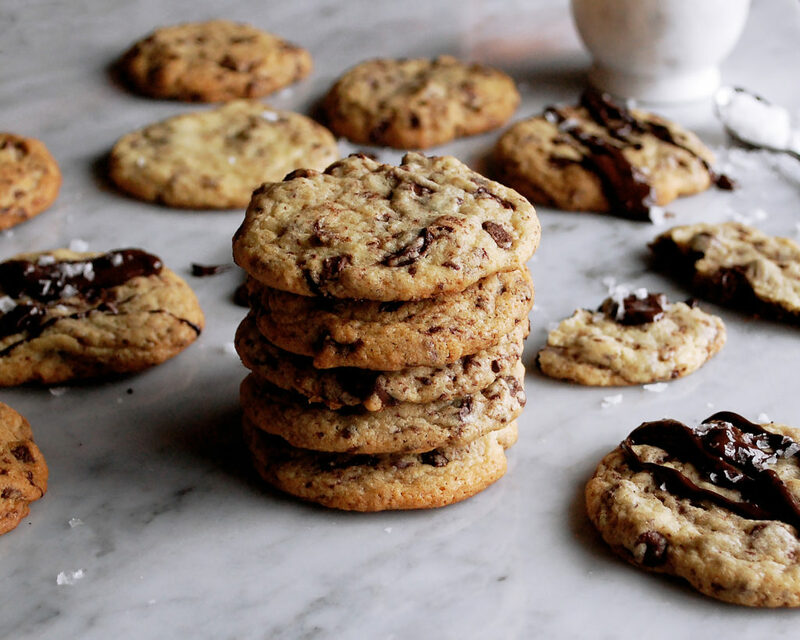 When it comes to chocolate chip cookies, this is my go-to recipe. 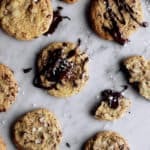 Or, if you have tahini on hand, I would highly recommend these salted tahini chocolate chunk cookies. The texture is totally different…so maybe make a batch of each? That’s at least my plan this weekend! Preheat the oven to 350F. In a mixing bowl, whisk together the flour, baking powder, baking soda, and salt. Set aside. In the base of a stand mixer, add the butter and both sugars. Using a paddle attachment, cream the butter and sugar until smooth and fluffy, scraping down the sides of the bowl as needed. Mix in the eggs one at a time. Mix in the vanilla and almond extracts. Gradually mix in the dry ingredients, scraping down the sides of the bowl as needed. Once the dough comes together and all the ingredients are fully incorporated, add the dark chocolate chips. Mix for just a second until the chips are evenly dispersed. Spoon the cookie dough onto a cookie sheet, about 2 tablespoons of dough per cookie. Bake the cookies for 13 minutes. 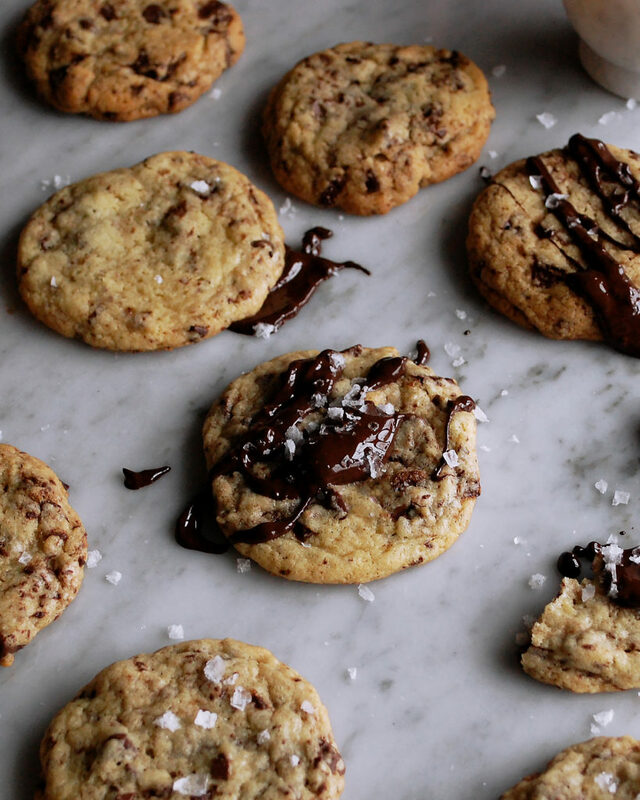 Finish the cookies with a drizzle of melted dark chocolate and a pinch of flaky sea salt.